We’re on the last leg of our Korea trip and this time it’s none other than Jeju-do! I love Jeju for its great local food and nature (and no, not really because Song Joong Ki is Jeju Air’s ambassador of the moment). There are several waterfalls around this little island but since we aren’t allowed to swim in them, they aren’t my favourite spots. I mean, after having been to Tjaetaba Falls and Buley Rockhole in Litchfield, Australia, any other spring or waterfall that doesn’t allow you to soak in it just doesn’t cut it for me anymore. Of course, I’m aware it’s for safety reasons. But not being able to get into the water takes out some of the fun, and I’d really prefer visiting places that are safer. For the summer, this is the place to be when visiting Korea. You get nutritious food, great exercise with all the outdoor trekking you can do, plus you can also drop by the beach when you feel like it. 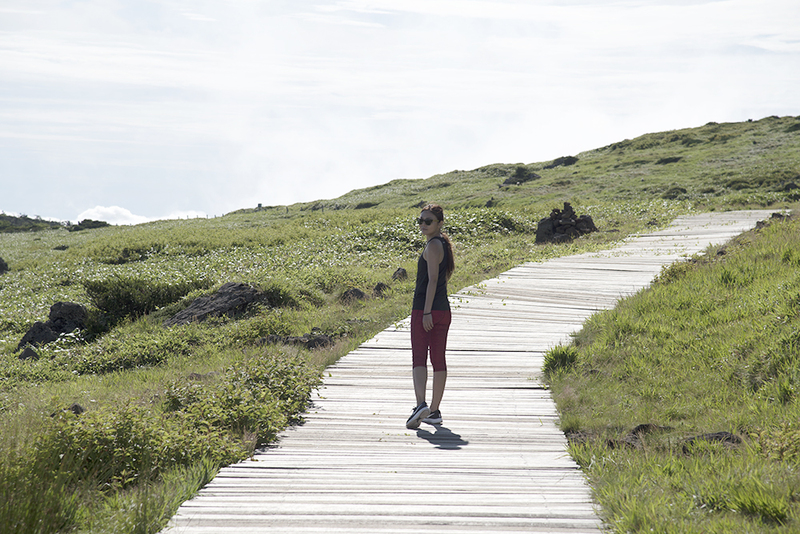 Jeju is the place where you can achieve the beauty glow from within. Here are 10 things to do in Jeju, all of which are featured in my video above. I don’t think I’ve ever had a shrimp burger that can match the one here. Although HaHa HoHo Cafe is popular for its black pig garlic burger, I highly recommend the shrimp one instead. They have 2 outlets, one in Udo and the other in Seogwipo. The one in Udo seems to be the one that most people have visited, but if you prefer something that’s not on the beach and has a quiet setting where you can sit and calmly enjoy your food, go to the Seogwipo one. We loved the burgers so much that we went there another time before our trip ended, and the staff gave us a free serving of fries to thank us for returning! Check out the burger in my video above. If you like wind surfing, or watching people wind surf, Jungmun Beach is the place to go. The black rocks plus an endless view towards the horizon make for a refreshing getaway. The second fall of Cheonjeyeon Falls. 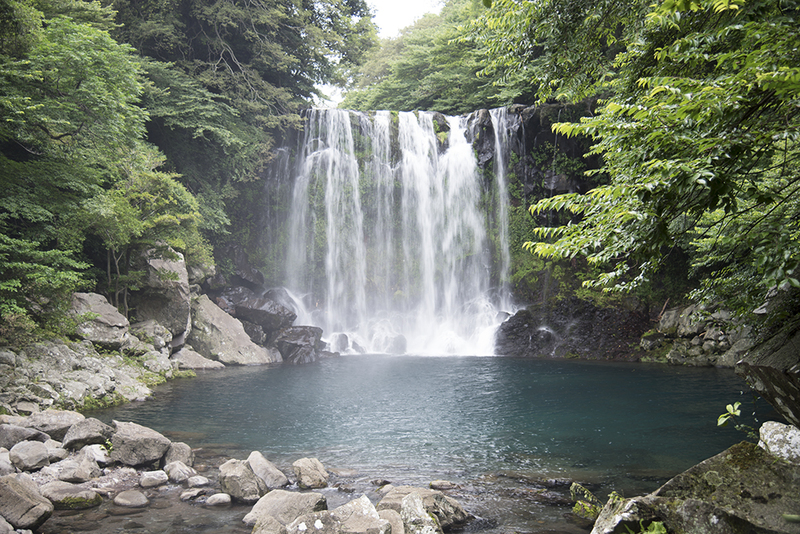 One of the popular waterfalls in Jeju, this is one that’s got really gorgeous turquoise water. If you’re lucky, you won’t have to jostle with other tourists who also want a shot with the falls in the background. Just around Cheonjeyeon Falls, you’ll see a huge bridge. This is called Seonimgyo Bridge and it might tire you out just to cross it (the heat in the summer makes everyone weary). It has 7 nymphs carved out on each side of the bridge – a special feature of it you won’t miss. If you like green tea, you should definitely check this place out. It’s more of a cafe than a museum though, with just a very small section that exhibits tea ware from all over the world throughout the ages. There are several munchy favourites here, but everything is made from green tea. Try the cake, drinks, soft serve ice cream and more. So. Good. The tea plantation across the road is also a great place for photo taking and memory making. This is a must-visit place for anyone who goes to Jeju and is into Korean beauty. This store is located just beside the O’Sullloc Green Tea Museum, so you should do them both together. You’ll find Jeju-exclusive skincare products (also sold in only one other outlet in Samcheongdong, Seoul) and be able to make your own soaps. Everything here would do very well as gifts and souvenirs for loved ones back home. It’s a treasure trove of skincare finds, me thinks. Another famous beach in Jeju is Hyeobjae Beach. The waves here are much milder than those in Jungmun Beach (so, great for kids), and there are more stalls around. There are plenty of umbrellas around, but I’m not sure if you’ll need to pay to use them. Anyhow, you can always just lay your towels on the sand for free and enjoy. Oh, don’t forget to people-watch too. Just saying. Almost at the top of Mount Hallasan. This is by far the best thing we did in Jeju, and I can’t recommend this enough! We picked Yeongsil Trail, which turned out to be harder than I expected. The trail doesn’t lead you all the way to the top of the mountain for now – and probably not for the next 10 years – but it takes you pretty close. And the views are amazing. If you’re here in the summer, don’t forget sunscreen. The trail usually takes 2.5 hours to finish but if you’re going to stop regularly and take photos, or admire the views along the way up, you might need closer to 3.5 to 4 hours. Make sure you start your trek before 2pm or 3pm, because if you reach the base later than that, you will not be allowed up. Think volcano, lava, smoke, cold, sizzle, solid rock. That’s basically how the cliffs here formed. Nature is so amazing! There are definitely many other local restaurants around in Jeju but if you’re looking for one that’s close to the airport and has the traditional hard-to-find meomguk dish, this place is where you should go to. The food here is amazing, and the staff kind. They don’t really understand English, but they can recommend you the best dishes of the house. I mean, just check out what we ate in the video above! I know I said 10 things to do in Jeju, so here’s a bonus if you’ve made it this far. You need to rent a car. Make sure you have your driver’s license and an international driving license before renting one. They are very particular about this, for some reason. During the low season, a car might set you back by about 30,000 KRW per day (don’t quote me on this, it was the Nike sales person in Busan). We were there during the peak season, so it cost us around 70,000 KRW instead. The price included unlimited mileage though, so I guess that was good enough. I strongly recommend reserving a car before getting there, because if it’s the peak season, most car rental companies actually sell out pretty fast. So there you have it, my personal recommendations on the things to do in Jeju. There are definitely more things to see in Jeju, such as the Hello Kitty Cafe. 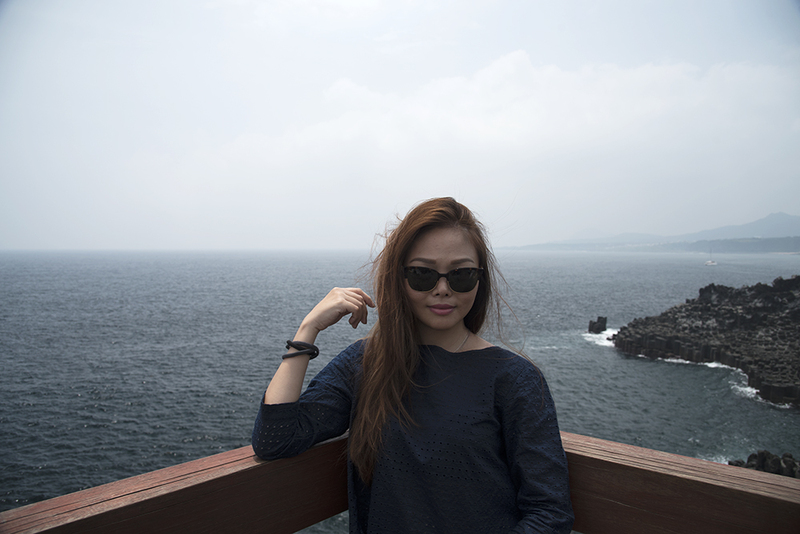 We had limited time in Jeju and I wish we could have been there for longer. Never mind, there’s always next time! Korea Trippin’ 2016: Jelly for Jeju was last modified: August 11th, 2016 by Roxanne C.